Meet the box-office hit of 1906. Know how popular it was? It sold a staggering 192 copies that year. 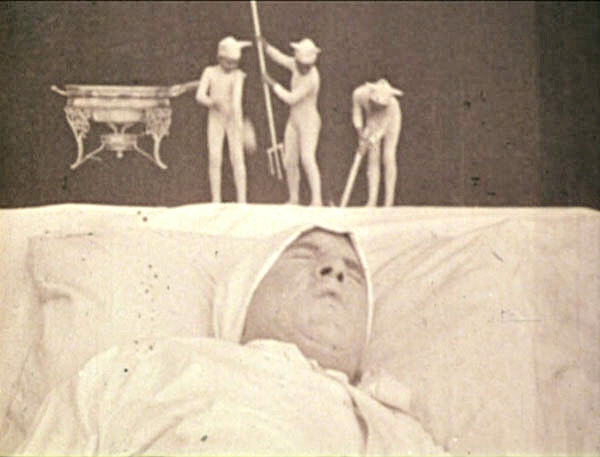 Bruce Posner classified it as an early example of American surrealism in film, and included it in the epic collection Unseen Cinema: early American avant-garde film, 1894-1941. It took nine days and about $350 to make. It’s a trick film, a gag film. McCutcheon and Porter steal liberally from the experiments of Georges Melies in France, utilizing double exposure, stop-motion and other tricks in the attempt to adapt the comic fantasies of one of America’s most inventive cartoonists. Fiend originally concerned the nightmares of a deprived tobacco smoker, but soon morphed into a recurring strip about a fancier of Welsh rarebit, a seasoned-melted-cheese-on-toast dish that McCay fancied gave the eater the midnight conniptions. 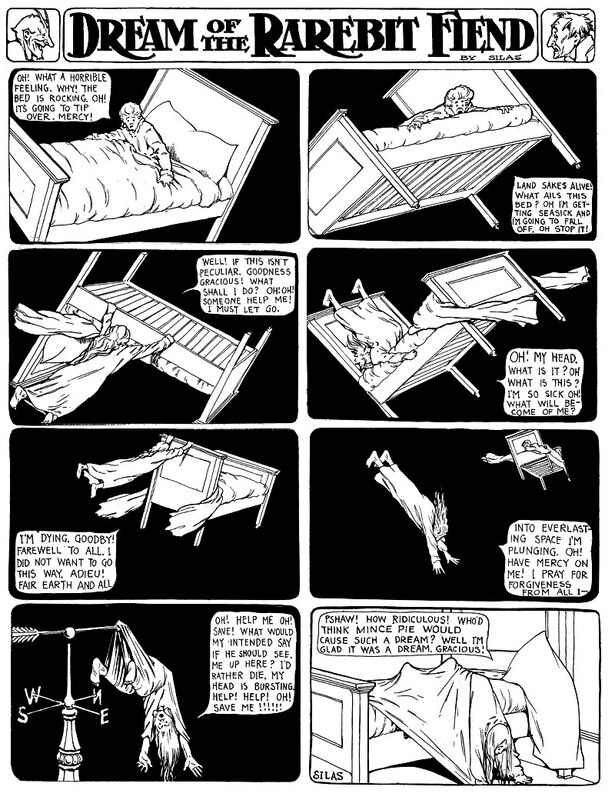 These are not funny, pleasant strips – McCay exposes fears, imagines humiliations, takes on money, marriage, religion. 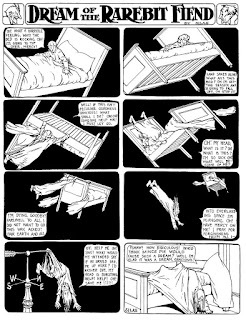 McCay violates topic boundaries as frequently as he does the traditional panel structures. His stretching, expansion, and distortion of forms became a key way for American culture to define the look of nightmare and hallucination. The strip from January 28, 1905 that inspired the filmmakers. Due to the strip’s immense popularity, it became worth the challenge to try and put it on film. Here we see a top-hatted, beer-swilling, cheese-besmeared swell (Jack Brawn) who’s gobbling down large portions of the detested dish. He staggers in the classic vaudeville caricature down the street, and makes passes at a prop light post for support as two more exposures run beneath him, one rotating left, the other right. The whirligig effect was disorienting for the time. He even tangleswith a dwarf policeman. Coming home, he falls into bed, only to find his shoes and furniture dancing away, and tiny devils assaulting his head. A clever switch to a miniature shows the bed spinning like a top; the dreamer rides his bed over town, gets his nightshirt stuck on a steeple-topping weathervane, then falls, crashing through his ceiling with an eloquent splash of plaster and debris (a dummy flops forlornly to a halt on the floor). And another cut, and the live actor sits up in bed, awake. (Could this be the first it-was-only-a-dream movie?) The dreamer, shaken and chastised, flinches and trembles. It may be the first film with a soundtrack as well. “The Dream of the Rarebit Fiend” was recorded by the Edison Military Band, and no doubt was paired with the film at one time. Fiend is an amusing exercise, and a fascinating glimpse into how singular solutions to specific filmmaking problems broadened the possibilities for filmmakers to come.